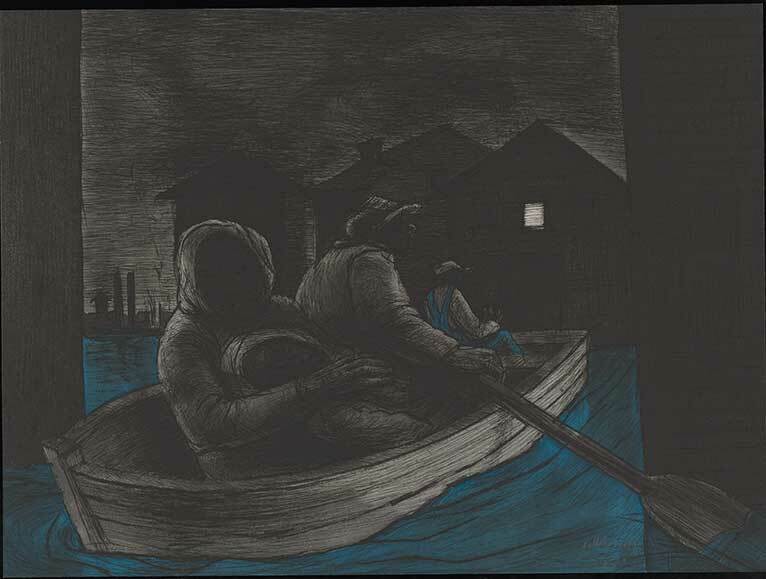 The dark male figure, head bent to the driving rain indicated by the dense lines that cover the page, lifts a slight woman into a simple rowboat. The boat’s bow is pointed through the floodwaters toward higher ground, its port side steadied by a second stooped male. In the low shadow of the simple, slat-shingled roof, an elderly woman grips a small boy close to her side, her face angled with lines of worry and fear. John Woodrow Wilson (American, 1922–2015), The Richard Wright Suite, 2001. Color etchings with aquatint. Museum purchase, 2001.5.4. Licensed by VAGA, New York, NY. Reproduction, including downloading of John Wilson’s works is prohibited by copyright laws and international conventions without the express written permission of Artists Rights Society (ARS), New York. In the next image, the huddled figures have managed to shift the small craft against the current and toward the beacon of a lighted window of a large house. John Woodrow Wilson (American, 1922–2015), The Richard Wright Suite, 2001. Color etchings with aquatint. Museum purchase, 2001.5.5. Licensed by VAGA, New York, NY. Reproduction, including downloading of John Wilson’s works is prohibited by copyright laws and international conventions without the express written permission of Artists Rights Society (ARS), New York. Despite the promise inherent in that scene—a small square of light piercing an otherwise dark and muddled picture plane—the next print in the series finds the central male figure stooped over the body of a lifeless woman, the line of her left arm draped sharply over the edge of an examination table, while a white male figure looks on with a bland expression revealing acknowledgement more than pity. This print, the only one in the series to be executed solely in black and white, appears stark and drained. John Woodrow Wilson (American, 1922–2015), The Richard Wright Suite, 2001. Color etchings with aquatint. Museum purchase, 2001.5.6. Licensed by VAGA, New York, NY. Reproduction, including downloading of John Wilson’s works is prohibited by copyright laws and international conventions without the express written permission of Artists Rights Society (ARS), New York. 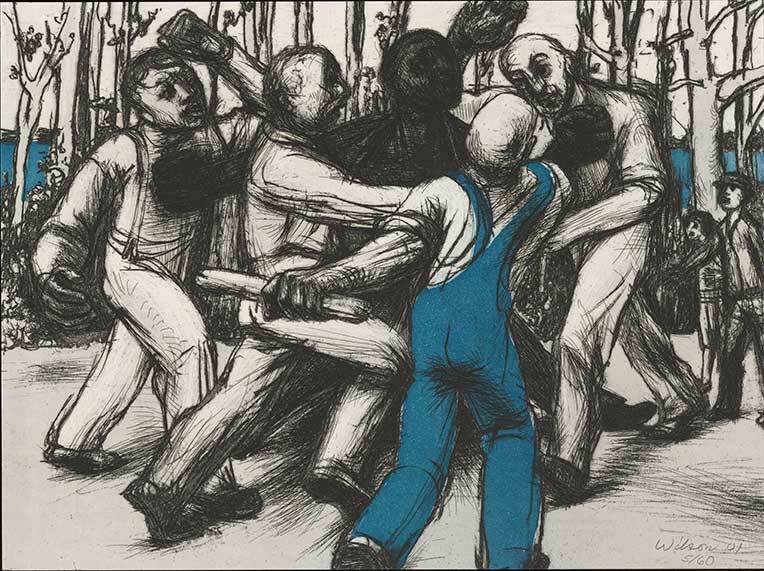 The fourth print takes a turn: the lines slicing through the previous prints in indication of darkness and rain are here gone, those lines replaced with the raised arms of attackers in crowded visual confusion around the central figure, and by the sharply angled limbs of the leafless trees at the river’s edge. The jarringly white sky of the final two prints, in contrast to the thick, muddied appearance of the previous images, registers as exposure rather than hope. John Woodrow Wilson (American, 1922–2015), The Richard Wright Suite, 2001. Color etchings with aquatint. Museum purchase, 2001.5.7. Licensed by VAGA, New York, NY. Reproduction, including downloading of John Wilson’s works is prohibited by copyright laws and international conventions without the express written permission of Artists Rights Society (ARS), New York. 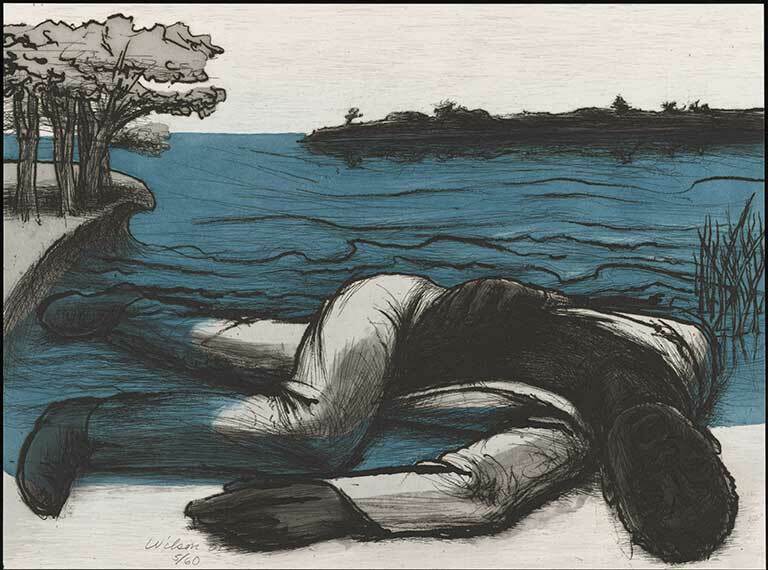 In the final print, a lifeless black male body, twisted unnaturally, lies at the edge of the receding river. It fills the lower half of the image, confronting the viewer with its unnerving combination of agitated angle and stillness. John Woodrow Wilson (American, 1922–2015), The Richard Wright Suite, 2001. Color etchings with aquatint. Museum purchase, 2001.5.8. Licensed by VAGA, New York, NY. Reproduction, including downloading of John Wilson’s works is prohibited by copyright laws and international conventions without the express written permission of Artists Rights Society (ARS), New York. 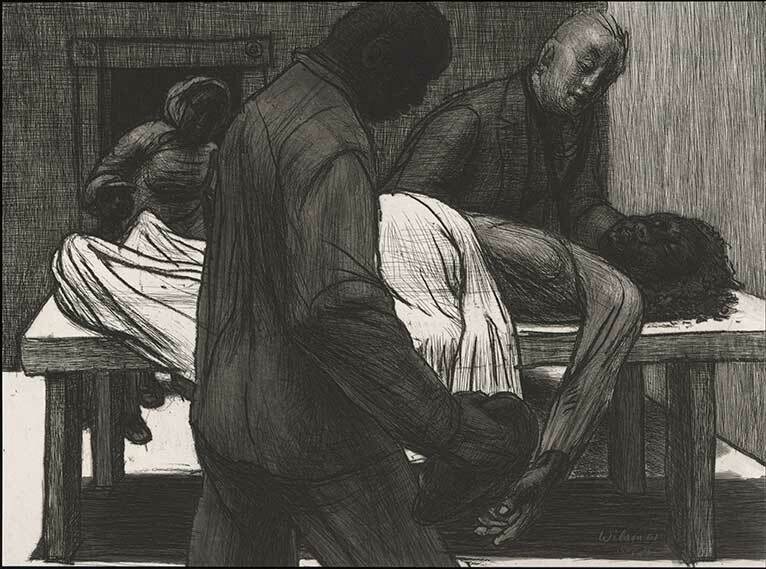 Even without knowing the story these prints illustrate, we sense from the images alone that this male figure has died largely because he was black. The prints are part of John Wilson’s 2001 series The Richard Wright Suite, created in conjunction with the Limited Editions Club publication of Down by the Riverside from the same year. That story was originally part of Richard Wright’s 1938 collection of novellas, Uncle Tom’s Children. The backdrop and driving force of Down by the Riverside is a devastating flood. Against the rising waters and the threat of the levee breaking are a southern black family’s desperate attempts to escape to safety. Protagonist Brother Mann has been offered a stolen boat; balancing the risk of being a black man found with a stolen white man’s boat against the risk of his wife’s premature and life threatening labor, he decides to use the boat to transport his son, mother-in-law, and wife Lulu to the hospital. 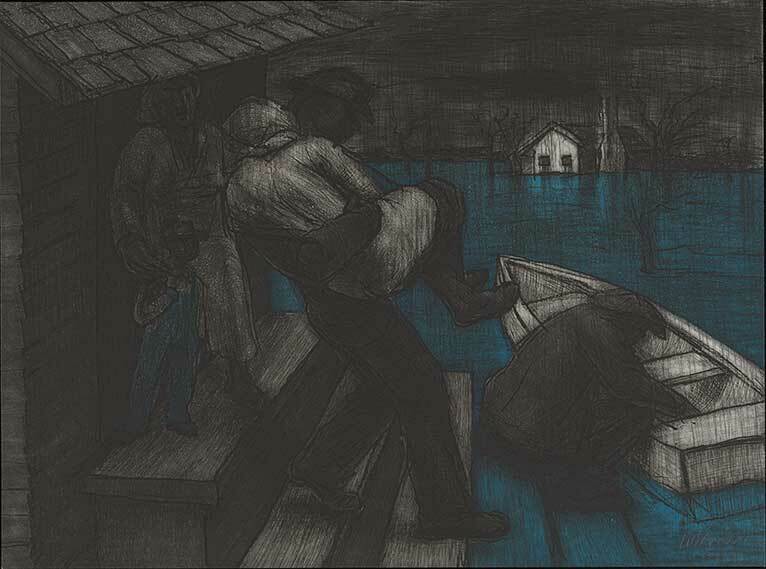 Mann rows his family through the confusion of a once-familiar landscape that the floodwaters have rendered unrecognizable, and heads toward the lit window of a large house. Mann calls out to the inhabitants of the house, where, to his terror, he finds not help but the stolen boat’s white owner. Realizing the affront, the boat’s owner fires his pistol in the direction of Mann and his family. In an act of desperate self-defense, Mann kills the man and frantically rows against the current toward the hospital. The family arrives at the hospital too late: Lulu and her unborn child have died. A distraught Mann is now conscripted into assisting with flood rescue efforts. In this new role—knowing too well that the action will likely result in his exposure—he saves the family of the man he had earlier killed. Upon reaching higher ground the rescued family immediately reports the earlier killing. The story closes with the body of Mann, who has been shot to death as a murderer, laying by the side of the river. In the context of the pre-Civil War spiritual song from which it is derived, the phrase “down by the riverside” evokes the casting off of aggression and conflict. The phrase also, as Wilson’s final image poignantly demonstrates, conjures the final, literal image of Mann’s body, lifeless at the water’s edge. The bitter paradox of that juxtaposition—the active decision to turn away from aggression jutting up against the image of Mann’s violent death—is further exacerbated by the on-the-surface benign, even idyllic, sounding phrase. Wilson elected to use a form of etching known as aquatint to create these prints, stating in his afterword that the technique is an ideal one for interpreting the “dark brooding, murky atmosphere” of Wright’s story. The aquatint method—in which grains of rosin are heated and the resultant acid “bites” create a rough surface on the plate—produces a print with a painted, rather than etched, appearance. Such a technique speaks both to the forces of nature that drive Mann’s desperate flight and to the violence that confronts him at the story’s close. These images of a desperate family escaping rising floodwaters are today impossible to view without considering the recent catastrophic hurricanes and tropical storms that have resulted in scores of displaced lives and the ways in which the longreaching aftermath of such storms tend to be particularly disastrous for underprivileged populations. In a Ransom Center copy of Uncle Tom’s Children, Wright penned an inscription to the book’s former owner, filmmaker and poet Willard Maas, in 1938. “To Willard Maas,” the author writes, “in hope that we may stand shoulder to shoulder in that fight that represents the last, best hope of this earth.” In an essay published only two years later, Wright would reconsider the book’s power, asserting that it was an inadvertently sentimental and “naïve” attempt to address ongoing injustice on the basis of race—one that, he feared, fostered the release of cathartic tears rather than served as an inescapable call to action. The tragic plight of the Mann family is undeniably poignant. 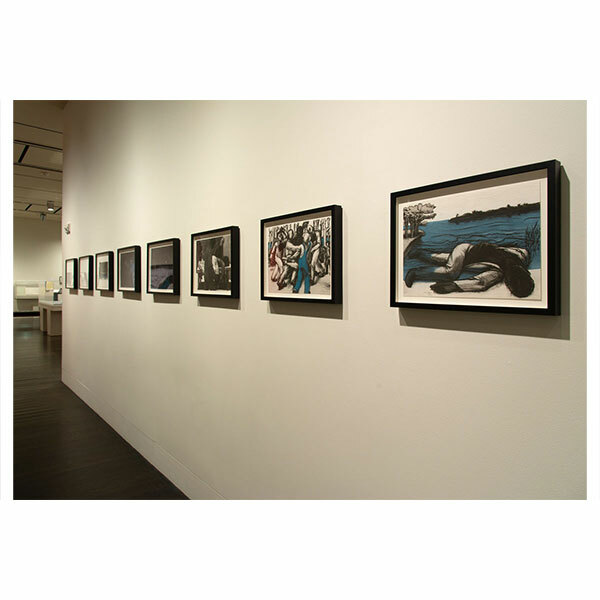 But Wilson’s prints, currently on view at the Ransom Center as part of Stories to Tell, help demonstrate the haunting timeliness of their depiction of displacement, separation and loss, tragedy, and desperate hope. This story originally appeared in the Fall 2018 issue of Ransom Center Magazine. As Curator of Art, Dr. Bonfitto oversees research, access, and interpretation of the Center’s art holdings.